Teeth whitening is a popular cosmetic treatment that can be administered in a variety of ways. Your best option may be choosing one recommended by your dental professional for bright and long-lasting results. Dr. Dustin Karren and our dedicated team at Karren Family Dental believe a beautiful smile can make for a positive attitude. Our laid-back atmosphere creates a trusting environment that supports successful treatment. We help our patients lift tough teeth stains with customized take-home teeth whitening in Phoenix. Call today to set up an appointment! The results produced by conventional whitening methods tend to last up to six months, and generally only brighten the visible surface of your teeth by a few shades. Dr. Karren helps our patients interested in improving their teeth’s appearance select a method that produces comprehensive results. Our practice offers Opalescence® and Sheer White®, two teeth whitening brands that provide you beautiful a bright, white smile from the comfort of your own home. Opalescence offers several beneficial enhancement products, and at our practice, we recommend the best at-home option that suits your needs. With Opalescence Go®, you won’t need to have impressions taken or wait for customized trays to be produced. There are several flavors and strength levels of the whitening gel, granting users customizable options to achieve their desired results. With post-treatment touch-ups, the results can last for up to 24 months. By wearing Opalescence for 30 minutes a day over the course of ten days, you’ll benefit from the effectiveness of a professionally administered product in a safe and convenient way. After your initial whitening, you can also bolster your post-procedure maintenance with brushes and pastes designed specifically to maintain and support your bright smile for months after treatment. Sheer White supplies professional results with the convenience and simplicity of many similar store-bought brands. This option can only be prescribed by a dental professional and is designed to brighten your teeth up to five shades by wearing them for one to two hours a day for five days. Sheer White sets itself apart from other whitening strips because of the SheerFilm® material guaranteeing individualized results. The strips mold perfectly around your teeth for a comfortable and discreet whitening method. While there are plenty of over-the-counter options to achieve a brighter, whiter smile, few are as effective as the options Dr. Karren recommends to our patients. 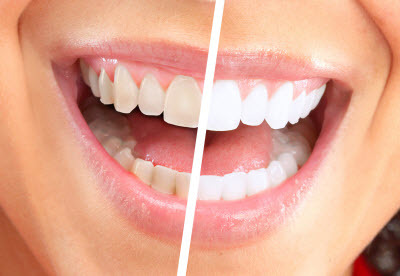 If you’re looking for quality teeth whitening in Phoenix, particularly the communities of North Phoenix and Moon Valley, call Karren Dental to set up an appointment today.